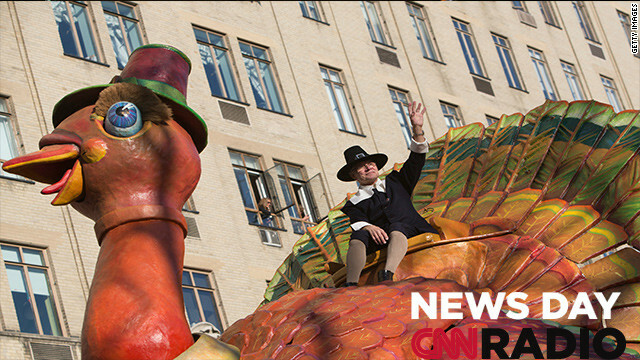 NEW YORK, NY - NOVEMBER 22: The Tom Turkey float makes its way through the streets of Manhattan during the 86th Annual Macy's Thanksgiving Day Parade on November 22, 2012 in New York. Turkey, ham, roast beef - they're all holiday table traditions, but what do vegans and vegetarians have to look forward to? Where can they turn for that festive family feast? Fear not! Their holidays don't have to consist of limp green beans and creamed carrots thanks to the Tofurkey. CNN's Tommy Andres takes us to Mt. Hood, Oregon where the Tofurkey was "born" for a glimpse into how the turkey substitute is made. "We pump tofu throughout the plant, just like you would pump water. It's a lot like Willie Wonka's chocolate factory. I guess it's Willie Wonka's tofu factory", says Seth Tibbot, founder and president of Turtle Island Foods, home of the famous Tofurkey. After the feasting, comes the shopping. For millions of Americans the Friday after Thanksgiving is the time to shop till you drop. But as CNN's Barbara Hall reports, this year Congress may have a lot of influence on how much Americans will spend. "There's no question that these negotiations over the Fiscal Cliff are happening at the worst time", says Kathy Graniss of the National Retail Federation. On a much more somber note, the increasing demand for food by people in need is now outpacing the dwindling supply of donated items to food banks and organizations that help the poor. CNN's Jim Roope takes us to the Margaret Alyward Center for the Poor in Pico Rivera, California to find out more about the food crisis. "When I see a big grown man crying, it hits hard to see that", says Sister Joan Hogan as she fights back tears because there isn't enough food to be able to give to everyone who comes to her center for help. Wow, superb blog format! How lengthy have you been blogging for? you made running a blog glance easy. The entire look of your website is magnificent, let alone the content!